Versus Evil and Obsidian Entertainment have outlined the three in-depth expansion packs for Pillars of Eternity II: Deadfire. These expansions will include new quests that will add to the lore of Deadfire, new areas, secrets, and characters to come across. 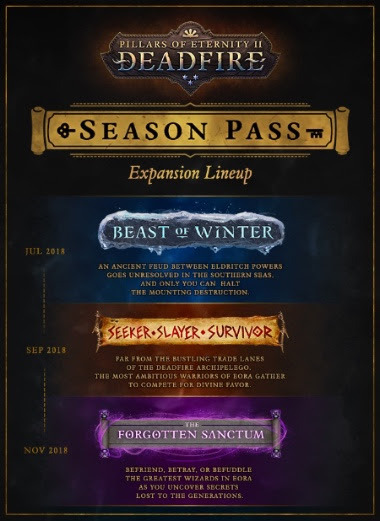 DLC 1 is Beast of Winter, available in July 2018. A mysterious doomsday cult is upon an island your party comes to, and with them hides an ancient secret. Then comes Seeker, Slayer, Survivor, scheduled for September 2018, and is a combat-focused expansion, taking place on a previously undiscovered island that will challenge the martial prowess of the party and rely on your tactical skills heavily. Finally there’s The Forgotten Sanctum, available in November 2018. It will test your party’s allegiance and morality in a quest to help (or hinder) the great wizards of Eora. Whether you befriend, betray or befuddle them is up to you. Your actions will have consequences across the Deadfire Archipelago. All three packs are included as part of the Obsidian Edition of Pillars of Eternity II: Deadfirewhich is available for sale now. A Season Pass including all 3 DLC packs will also be available for purchase when the game launches for $24.99. The expansion packs will be sold individually for $9.99 as they are released. FIG Backers that backed at the Collector’s Edition tier or above or included the Season Pass as part of their backer pledge will also receive the Season Pass.